Italy returns missing foot to Greece. The “Palermo fragment” was originally part of the collection that Lord Elgin removed from the Parthenon in the early 19th century. He reportedly gave the fragment to a British Consul in Sicily in 1816, and it has spent nearly two centuries in the collection of the Antonio Salinas Archaeological Museum in Palermo. 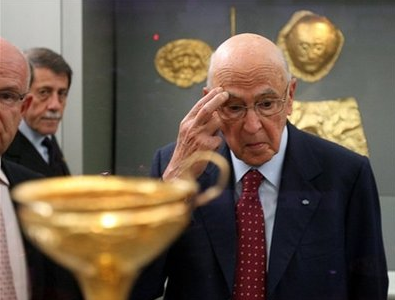 Italian President Giorgio Napolitano suddenly realizes he just gave away part of the Parthenon. The homecoming was a happy one, as Greece has sought the return of the Palermo fragment for nearly 13 years. 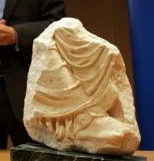 Italian President Giorgio Napolitano delivered the fragment to Athens yesterday. It will technically be on permanent loan from the Palermo museum to Greece. In recent years, Greece and Italy have both been aggressively pursuing the return of looted or illegally exported. Greece has had more success as of late, securing the return of artifacts from sources abroad including the J. Paul Getty Museum in Los Angeles and the Shelby White Collection in New York. It is anticipated that the Vatican will return two Parthenon fragments on October 8. “Demand for uniting the marbles of the Parthenon is gaining in strength and reach,” Greece Prime Minister Costas Karamanlis said. Karamanlis is enthusiastic because for every museum and collector that agrees to return a Parthenon fragment or sculpture, the notion that Lord Elgin in fact stole the collection is that much more legitimized. The hope is that eventually Britain will experience such public pressure that they will be forced to return the Elgin marbles, or risk being seen as barbarians rebelling against international opinion. Meanwhile, the move follows Italy’s recent return of the Venere di Cirene (Venus of Cyrene) to Libya, which was discussed on this recent CPAL blog post. It seems sound strategy that if Italy is asking foreign parties to return stolen or looted Italian artifacts, that it does the same upon request. Italy returns long lost Parthenon fragment to Greece on AFP. Italy returns Parthenon marble fragment to Greece on CBC News. Italy has returned to Greece the ‘Palermo fragment’ on Xpat Athens. Greek PM welcomes artifacts returned by Getty on CBC News. Read up on the Elgin Marbles on Wikipedia. ← If cultural heritage were a tool, what tool would it be?